Meet Dragon+, the newest addition to your Dungeons & Dragons library! Inside you’ll find interviews, features and comics that cover all things D&D—whether you play with a controller, mouse and keyboard or pen and paper. 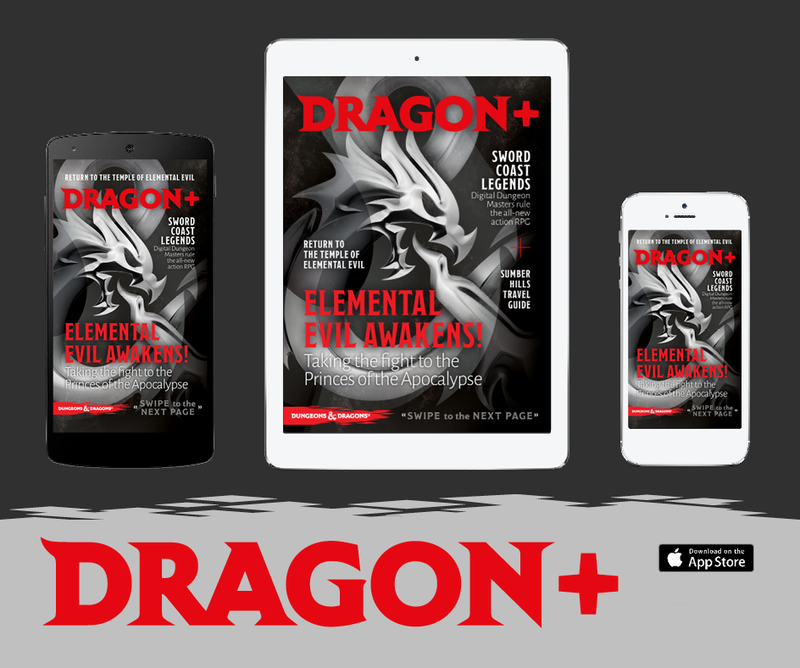 Free on iOS and Android devices, you’ll be able to stay up to date on the latest Dungeons & Dragons news and stories no matter where you go. In the first installment, we take a closer look at the new Elemental Evil story and how it plays out in the tabletop adventure Princes of the Apocalypse as well as the Neverwinter MMORPG. We also sit down with Dan Tudge to talk about n-Space’s new game, Sword Coast Legends, and get our first look at the lovable Gauntlet Gophers in Tavis Maiden’s new comic. There’s a lot more, but we’ll let you dive in and discover it on your own. Dragon+ opens a new doorway to adventure, and we’re excited to see where it leads. We’re just getting started so expect to see additions and changes as we move forward. And don’t forget to tell us what you think about the app by taking the survey found in the Letter from the Editor!